Women who are living with pelvic pain, vaginal bleeding, urinary incontinence, pelvic organ prolapse and other gynecologic issues, now have a Center of Excellence to turn to in the Kansas City Market. Overland Park Regional Medical Center’s Center of Excellence in Minimally Invasive Gynecology (COEMIG) has a team of physicians, highly trained nurses and support staff who can help. The physicians and staff at the COEMIG program at Overland Park Regional Medical Center focus on improving the safety and quality of gynecologic patient care and lowering the overall costs associated with successful treatment. COEMIG was designed to expand patient awareness of and access to minimally invasive gynecologic procedures performed by surgeons and facilities that have demonstrated excellence in these advanced techniques. Patients who undergo minimally invasive gynecologic surgery often experience less pain, reduced blood loss, fewer complications, shorter hospital stays and a faster recovery, when compared to traditional surgery. Our physicians participate in a national safety and quality improvement program that seeks to identify and accelerate adoption of best clinical practices and cost-effective solutions. Our hospital offers several minimally invasive gynecology surgery options, ranging from pelvic organ prolapse repair to hysterectomy. 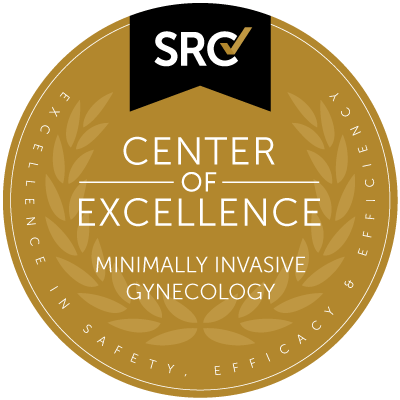 The COEMIG seal assures women that Overland Park Regional Medical Center and its team of physicians are committed to excellence in minimally invasive gynecologic surgical care. Q: Why are my periods so painful? A: Many women are plagued by menstrual cramps from time to time, but did you know that there is a medical term for it? Dysmenorrhea is the official name for menstrual cramps. Cramps can occur right before your period is about to start, and might continue for several days. While some women may be able to cope with these lower abdominal cramps, they may at times, debilitate you. You may sometimes notice other symptoms that coincide with the cramps including diarrhea, sweating, nausea, and/or feeling faint. Some women find that medication helps to ease their menstrual cramps while others swear by the use of a heating pad and other non-drug therapies. Interestingly, childbirth can sometimes put an end to dysmenorrheal unless it has been caused by a medical state. Talk to your doctor to discuss pain relief options that will work for you. Q: Can dysmenorrhea be prevented? A: Dysmenorrhea, intense pain and cramping caused by menstruation, occurs naturally in many women. Whether or not you can prevent it depends on the cause. Treatment for dysmenorrhea is designed to reduce pain and prevent future occurrences. For example, hormonal contraceptives can lighten menstruation and help prevent future pain. If dysmenorrhea is due to an underlying gynecological disorder such as fibroids or endometriosis, treatment of this disorder will prevent future occurrences. Q: My periods are really heavy. What treatment options do I have? A: If you have heavy periods you should discuss it with your healthcare professional, especially if you are feeling tired or lightheaded when you exert yourself or if you have been told that you are anemic. Let your doctor know if heavy periods are interfering with your quality of life since there are some treatment options. Also, after menopause it is important that any bleeding be discussed with your doctor. Common causes for having a wave pool during your period include having a polyp, fibroids or too thick of an endometrial lining. Often, these can be controlled with oral contraceptives, but if your bleeding lasts for greater than seven days or you need to change tampons more than every two hours, you need a doctor. Same goes if your periods disappear for greater than 3 months. Q: My doctor says I have cysts. What does that mean? A: Ovarian cysts may occur during the process in which an egg is released from the ovary (ovulation). During the days before ovulation, a follicle grows. Usually for most months during ovulation, an egg is released from this follicle. However, if the follicle fails to break open and release an egg, the fluid stays in the follicle and forms a follicular cyst. An endometrioid cyst is caused by endometriosis. Pathological cysts include those found in polycystic ovary syndrome (PCOS) or those associated with tumors. Ovarian cysts are somewhat common, and they are more common during a woman's childbearing years (from puberty to menopause). Ovarian cysts are rare after menopause. Q: How are ovarian cysts treated? A: Most functional ovarian cysts are simple in nature and just fluid filled. If your healthcare provider believes that your cyst is just a simple fluid-filled cyst, these cysts tend to resolve on their own in 2-3 months. Some patients are placed on birth control pills to help keep them from ovulating, and by not ovulating they will be less likely to form functional cysts. If an ovarian cyst has not resolved in 2-3 months, then there is consideration towards surgical treatment. The surgical treatment for ovarian cysts is a laparoscopy in which a telescope is placed into the bellybutton and the cyst is either drained or removed. If ovarian cysts become very painful, there is the possibility that the cyst can be so heavy that it can cause a twisting of the ovary. This is a phenomenon called ovarian torsion syndrome. If a patient has ovarian torsion, then there is a decrease in the blood supply to the ovary, which can cause irreparable damage to the ovary and possibly kill the ovary. If a patient has ovarian torsion, this needs to be treated surgically so as to remove the cyst and untwist the ovary. Q: My doctor is recommending a hysterectomy. What kind of recovery can I expect? A hysterectomy may be needed for serious situations, such as cancer of the cervix or uterus. In other cases, a hysterectomy may greatly improve quality of life for women with heavy abnormal bleeding, pelvic pain, or fibroids. Today, most women are candidates for an outpatient laparoscopic or robotic procedure requiring only three or four tiny bandages on their belly. Patients are assessed and generally discharged within hours of surgery, allowing them to recover in the comfort and privacy of their own homes. Most patients feel fully recovered within about two weeks. Q: What is urinary incontinence? A: Urinary incontinence (UI) is a fancy name for the accidental release of urine, and it happens to one in four women. Things like pregnancy and childbirth, gaining weight, and aging changes can weaken the tissues in our bladders, leading to the occasional accident. But the good news is that we don’t have to just put up with it – there are treatments for all types of UI. Q: Who can get endometriosis? A: More than five million women in the United States have endometriosis. It is one of the most common health problems for women. It can occur in any teen or woman who has menstrual periods, but it is most common in women in their 30s and 40s. The symptoms of endometriosis stop for a time during pregnancy. Symptoms also tend to decrease with menopause, when menstrual periods end for good. In some cases, women who take menopausal hormone therapy may still have symptoms of endometriosis. Q: Is there a cure for endometriosis? A: While other treatments help to manage endometriosis, surgery is the only treatment that may provide a cure for the condition. Your doctor may recommend minor surgery in which only displaced sections of the endometrial tissue are removed. But even then, endometriosis comes back in most women. Surgery combined with medication to suppress the action of the ovaries is more reliable. If your case is more advanced and you are not planning on having children, your doctor may recommend a hysterectomy and oophorectomy (removal of your ovaries). For help finding a COEMIG-certified physician or for information about our Center of Excellence in Minimally Invasive Gynecology at Overland Park Regional Medical Center, please call (816) 823-0644.